Tomas Hernandez is owner of Blizzplanet.com since 2003. I post news about World of Warcraft, StarCraft II, Diablo III, Hearthstone, Overwatch, Heroes of the Storm, Blizzard Careers, and the Warcraft film. 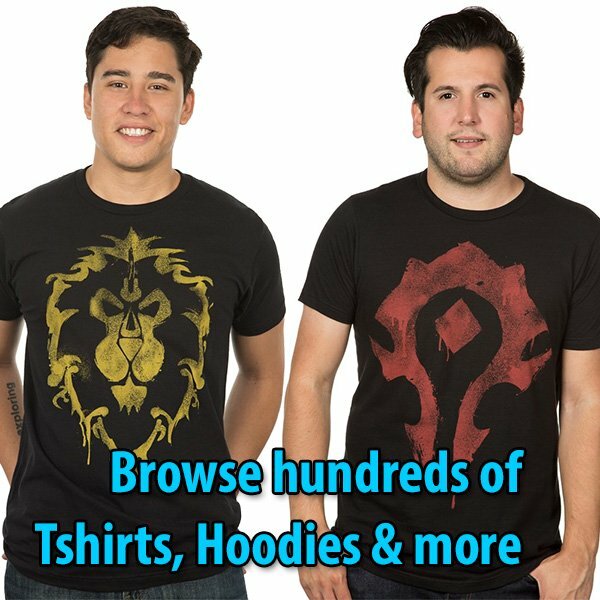 Blizzplanet is a leading fansite covering news about upcoming Blizzard Entertainment licensed products. I also post previews and reviews. I have interviewed book writers and Blizzard game developers. I was previously an employee of the OGaming Network (2003), and IncGamers (2008-2010). I was a guest newsposter for GosuGamers (World of Warcraft) a few years ago and for Diablofans.com (formerly Diablo3.com) ***Fans who would love to watch Blizzard-related panels and appreciate our efforts can support Blizzplanet's patreon in a monthly-basis, or a one-time basis. Our staff are volunteer fans like you. Your donations will help us travel to all the Blizzard events we attend year-round to bring you the latest interview with the developers, photos, and panel videos (where allowed). If you are a regular GOG member or recently purchased the Diablo game there, then you got an email today alerting the launch of Warcraft: Orcs and Humans and Warcraft II at GOG. The Allied Races: Kul Tiran is unlocked after completing the following achievements: A Nation United; Tides of Vengeance; and reach Exalted with Proudmoore Admiralty. Once these are completed, go to the Stormwind Embassy (52.14 13.36) to talk to Jaina Proudmoore who provides the starting quest: Made in Kul Tiras. Watch the entire Allied Races: Kul Tiran Questline videos as a playlist. World of Warcraft: Battle for Azeroth 8.1.5 is now live. If you have problems, or unsure what to look for — the following links show you gameplay videos to help you along the progression of questlines and content. Blizzard Entertainment just announced the dungeons and raids available in World of Warcraft Classic in bursts of content split into six phases. At BlizzCon 2018, we proposed a plan to give Classic four content phases. These were planned to be centered primarily on raid power progression. Currently, based on both your feedback and our own deliberations, we’re now planning to increase it to six phases. Our focus is still primarily on player power-progression, but we’re also aiming to capture what it felt like to play in a realm community in original WoW. To do that, we’re planning to mirror the approach taken by original WoW, with patches paired together. We’ll launch Classic with content from original WoW through patch 1.2.x, then the second update will include content that was in original WoW 1.3 and 1.4, the third Classic update will have 1.5 and 1.6 content, and so on. Our first phase primarily focuses on launching Classic with Onyxia and Molten Core, but we’ve decided to hold off on Dire Maul for a while. Maraudon is still in the first phase, because it was originally released on December 18, 2004, just two weeks after the first player hit level 60, but we recognize that Dire Maul is in a different category. Some of the loot that’s attainable from Dire Maul is so good that it would affect progression through those early raids. We’re also planning to hold off on releasing Kazzak and Azuregos at launch as well, for the same reasons. The next change we’re targeting addresses two concerns. First, Zul’Gurub and Blackwing Lair unlocking at the same time would differ from how they originally came out, and it makes sense to not have gear and enchants from Zul’Gurub available during early progress into Blackwing Lair. Secondly, the Emerald Dragons should be available earlier than the opening of Ahn’Qiraj, as they give us a way to start preparing nature resist gear for some of the encounters in AQ. Along the way, we’ve taken a close look at items that provide the biggest power gains, many of which were introduced in 1.10 as part of a sweeping dungeon itemization pass. That patch was when Tier 0.5 gear was introduced, and Relics were added to the drop tables of many bosses. It also adjusted drop rates and drop locations of a lot of gear (to make room for the Relics). We’ve gone back and reconstructed many of the most heavily affected drop tables as they existed prior to the 1.10 patch, and we’re planning to update the drop tables alongside the Ahn’Qiraj War Effort. Prior to the Ahn’Qiraj unlock, most of the drop rates and locations will look as they did in the patches prior to 1.10, with exceptions—there are lots of little changes made in earlier patches that don’t have a big effect on player power, and in those cases, we’re planning to use the 1.12 drop rates and locations. One example of the many items we’re planning for is: Titanic Leggings, which is a world drop that first appeared in 1.10. We can confirm that it will be controlled by the same content unlock that restricts the other 1.10 loot changes. We haven’t yet determined exactly when phases 2-6 will occur, and PvP content is notably missing from the list above. That’s because we’re still evaluating our options regarding PvP rewards, as they also changed over time (both in power and in terms of which PvP reward items were available). While we can’t elaborate on every detail of every step we’re going to take (yet), we’re here reading all of your questions and we’re going to keep the answers coming. The digital version of the upcoming World of Warcraft: Traveler #3 is coming on December 26, 2019. Pre-orders for World of Warcraft: Traveler #3 are now open. I recommend to pre-order. The usual price is $9.99, but the pre-order price is 50% ($4.99). The original author of the previous two books in the World of Warcraft: Traveler series: Greg Weisman, has been replaced with Madeleine Roux (ASYLUM series). The second book had a subtitle: The Spiral Path. However, the third book is missing a subtitle. Maybe we might hear about it at a later time when the official front cover artwork is revealed. The book description says this is the last book of the series. One last thing I need to share with fans. A few months ago, during my attendance to the New York Comic Con 2018, I asked Scholastic senior editor Chloe Fraboni during the Q&A if there were plans to publish new books based on World of Warcraft, StarCraft, Diablo or Overwatch. So there you have it… there is a new Scholastic/Blizzard project that today is still a mystery. However, I have to point out that earlier in the NYCC 2018 Scholastic AFK Panel, she mentioned she fulfilled one of her dreams by meeting … Jeff Kaplan during her visit to the Blizzard HQ. Who knows. Aramar Thorne and Makasa Flintwill have borne their fair share of troubles. Ever since Aram’s father entrusted him with an enchanted compass, Aram and Makasa have traveled the extraordinary lands of Azeroth, seeking out the shards of a legendary weapon: the Diamond Blade. The truth behind the weapon, and the terrible doom it seeks to prevent, seems to have been lost at sea with Captain Greydon Thorne. But not all secrets are meant to stay buried. As the pair struggles to stay two steps ahead of Malus and the Hidden-dangerous mercenaries and sorcerers who’ll stop at nothing to gain the compass-Aram and Makasa have assembled a powerful band of their own allies. From lively goblins and fantastic creatures to mighty druids and mysterious dryads, people are drawn to the talented young artist and the formidable fighter-a fortunate fact. For in their most desperate hour, Aram and Makasa will need all the help they can get to prevent Azeroth from being plunged into eternal darkness and chaos. This epic conclusion to the World of Warcraft: Traveler trilogy is penned by New York Times bestselling author Madeleine Roux and features stunning new artwork throughout. Blizzard Classic Games going to GOG.com? Recently, Blizzard Entertainment announced the original Diablo game is now available at GOG.com and that Warcraft: Orcs and Humans and Warcraft II were coming to GOG soon. This is a bold move, and a very intriguing one. We know that multiple Diablo projects are in development, and we know that Warcraft III: Reforged is in development. From a marketing point of view, transferring Diablo (1996) and Warcraft: Orcs and Humans + Warcraft II to GOG is a strategic decision. 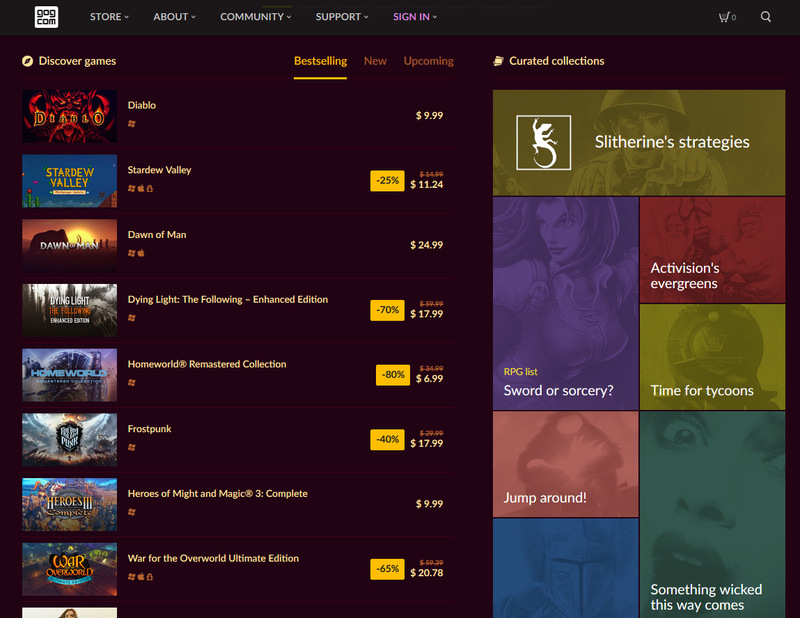 Right now, Diablo is listed as #1 Bestseller at GOG within just a couple of days. These quests start from items you loot from special mobs in Island Expeditions. More will be added as I encounter them. When you complete the “Battle of Dazar’alor” quest (by defeating Jaina) — which is part of the 8.1 Tides of Vengeance questline, turn in. Later, talk to Nathanos Blightcaller at the Banshee’s Wail boat in Port of Zandalar. 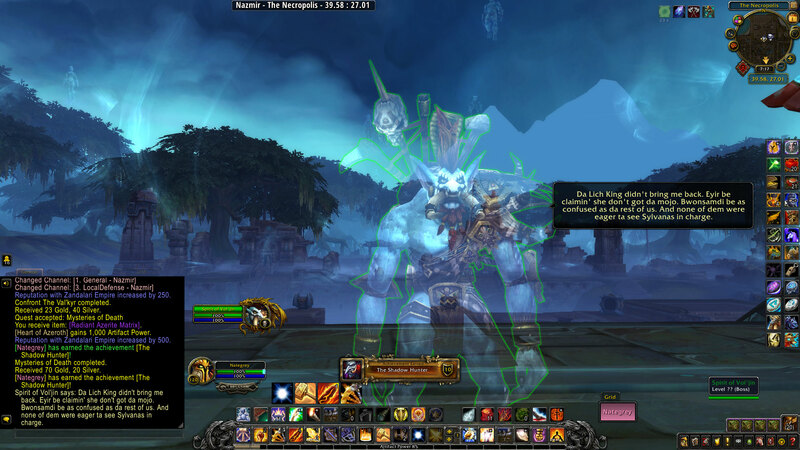 At that point, there is no follow up quest referring you to the Vol’jin questline. However, go to Baine Bloodhoof at The Great Seal in Dazar’alor. He will give you the quest: “Wisdom of the Warchief.” This starts “The Shadow Hunter” questline. The first quest in the Pride of Kul Tiras achievement questline is obtained when Alliance players complete the Loremaster of Kul Tiras achievement which entails finishing the story quests in Drustvar, Tirigarde and Stormsong Valley. 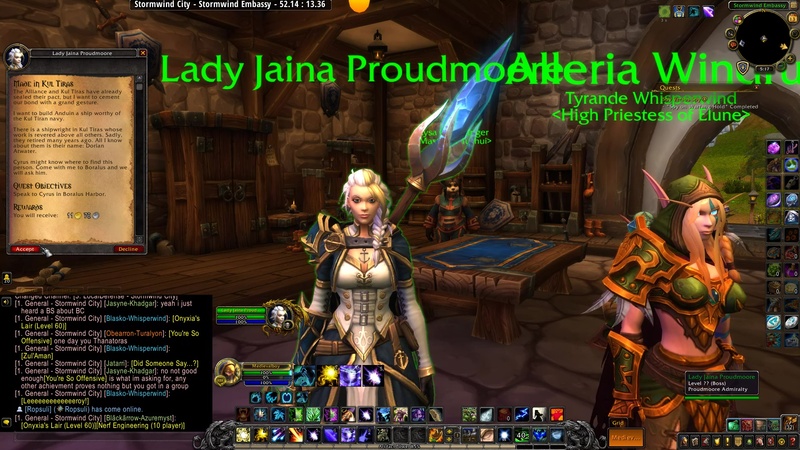 The Pride of Kul Tiras questline sets the player into searching for Lady Jaina Proudmoore, last seen when her mother Katherine allowed Lady Ashven to take her into custody and to arrange her fate. The questline culminates with the Siege of Boralus, and Katherine welcoming Lady Jaina and the Alliance. A requirement to unlock the Kul Tiran Allied Race. Check out my quest videos list if you need help completing the “Loremaster of Kul Tiras” achievement. Below is the list of quest videos for The Pride of Kul Tiras. Those who reach Zandalari or Kul Tiran Tailoring skill 150 will have access to the Tools of the Trade questline which starts near the Tailoring trainer in Boralus: Tradewinds Market (Alliance) or Dazar’alor: Terrace of Crafters (Horde). The Quest is given by Timeweaver Delormi (a bronze dragon disguised as a Nightborne).